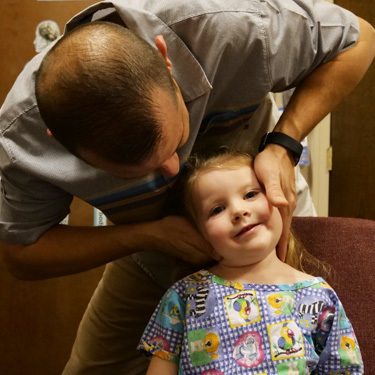 We love seeing kids here at Gonstead Family Chiropractic! After Dr. Jeremy had a son, he realized how essential it was to improve the health of our next generation. Our chiropractors for kids have undergone extensive training in pediatrics to be able to assist children. Our specific, gentle techniques for children are different than what we would do for an adult. They’re designed to make sure your child develops optimally and grows up happy and healthy. We’ll make sure they feel comfortable and safe in our environment. They will be reassured that they don’t have to worry about getting a shot. Yes; chiropractic is highly safe. It has an excellent track record of promoting optimal health. Best of all, chiropractic is non-invasive and drug-free. No, not at all. We adjust children differently than adults. Only light-force techniques are used. For example, with babies, we use just the same amount of pressure that’s used to check a tomato for ripeness. Delivery is stressful on the baby, so that’s why we like to check them as soon after birth as possible. We want to check to ensure that the nervous system is functioning optimally. If it’s not, we work to regain what’s been lost. Chiropractic also can help to boost the immune system, promote sound sleep and much more. What should I bring to my child’s first appointment? Please bring any questions you may have. We also will be getting your pregnancy history, your child’s birth history and their health history since they were an infant. Discover how chiropractic could help your child enjoy peak health. Contact us today! We’ll get your child booked for their first appointment. We’re open late to accommodate your busy schedule.